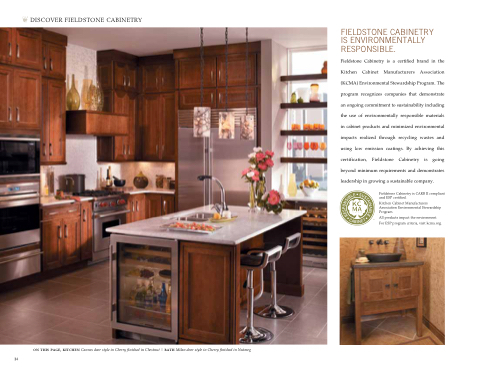 FIELDSTONE CABINETRY IS ENVIRONMENTALLY RESPONSIBLE. Fieldstone Cabinetry is a certified brand in the Kitchen Cabinet Manufacturers Association (KCMA) Environmental Stewardship Program. The program recognizes companies that demonstrate an ongoing commitment to sustainability including the use of environmentally responsible materials in cabinet products and minimized environmental impacts realized through recycling wastes and using low emission coatings. By achieving this certification, Fieldstone Cabinetry is going beyond minimum requirements and demonstrates leadership in growing a sustainable company.